Oh gosh, what a busy weekend! On Saturday the Fiasco and I headed down to Long Island to visit my family. We spent the day driving and then swimming and hanging out by the pool, which was lovely. On Sunday, we went to Robert Moses State Park on Fire Island, the beach of my youth. I always tease the Fiasco because he thought the beaches here in Connecticut were “real”. They are not “real”. 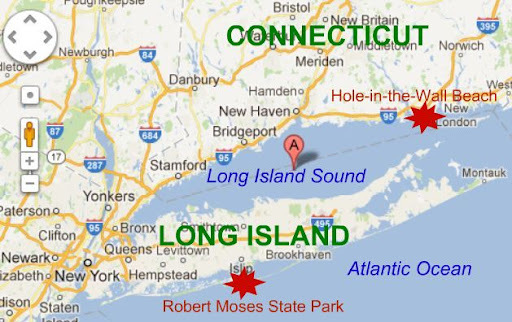 They are sandy little spits of land covering bedrock bordering Long Island Sound. They’re pretty and they’ll do, but they are small and calm and contained., like Hole-in-the-Wall Beach shown below. It is not very large and is bordered on each end by rocky headlands, it’s a good example of a “pocket” beach. But the barrier beaches off the south shore of Long Island are huge, wild, and fierce. Dropped by the glaciers eons ago, they are miles and miles long, backed by sand dunes and surrounded by water. That photo doesn’t fully convey the size of the beach, it’s probably easily a few hundred times larger both length- and width-wise than any Connecticut beach. And if we’re being honest, sizes matters. You need that huge expanse of open land to really feel the awe of the ocean. And because it is a nationally protected seashore, there is no development on that part of the island. I didn’t realize how special that was until I lived in places like Florida, Virginia Beach, and Connecticut where the entire coastline is developed. You’ll have a lovely beach with a strip of giant hotels or apartment complexes just behind it, it’s not right! Long Island is not a perfect place by a long shot, but it does do its beaches right. Who doesn’t love a little map action? What’s the dorkiest thing you’ve done today, or ever? This entry was posted in Science&Nature, silliness by shoelaceswitcher. Bookmark the permalink. No photos? No knitting? Oh no! Oh well, the only think that really matters is that you are having a great time and learning something new (even if it is a little dorky). Don't worry about the dorky thing, I own a Halo themed Xbox and have somehow managed to be proud of that. Sounds like a great trip. Gotta say, the dorkiest thing I've done lately was probably nerding out around my non-knitting friends about knitting. They get a bit annoyed with glazed over eyes the second I mention the yarn shop. Haha, my Fiasco is big on Xbox, too! Don't worry, I embrace my inner dork.